Last year Officine Panerai debuted its Due collection of Luminor models featuring the lightest and thinnest cases ever offered by the brand, an attempt to attract customers who had previously considered the military-derived dive watches too bulky and heavy. That was, of course, the appeal for some enthusiasts as Panerai’s pieces attract purists who like the fact that they stay reasonably true to the original tool watches made for Italy’s elite underwater commandos. 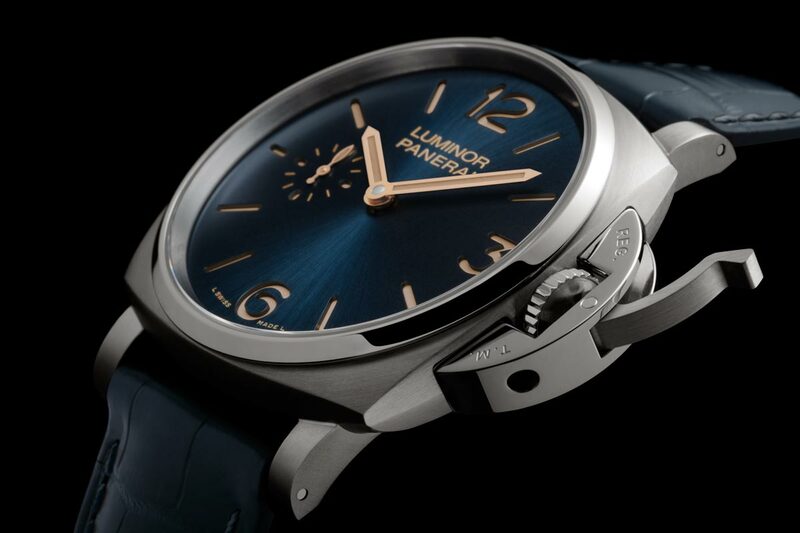 The Luminor Due collection, with cases 40% thinner than the original Luminor 1950 models, is handsome enough however to be an additional asset in the Panerai portfolio rather than a mere dilution of its core values, as evidenced by the four new designs from the Italian-designed, Swiss-made concern that has been gaining ground on its horological rivals. 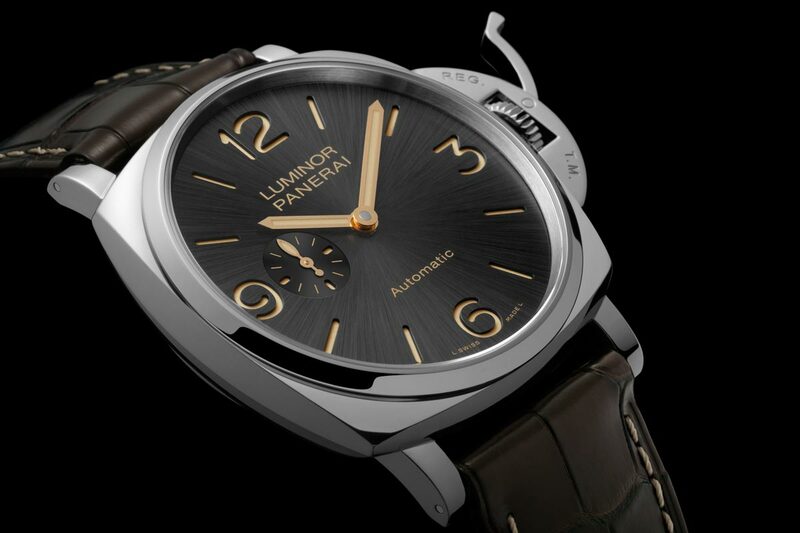 The attractive collection by Panerai, the Luminor Due, features four different dials and includes the Luminor 3 Days Titanio in titanium, the Luminor Due 3 Days Oro Rosso in rose gold, the Luminor Due 3 Days Automatic Titanio in titanium, and the Luminor Due 3 Days Automatic Acciai in stainless steel. The 42 mm Luminor 3 Days Titanio is being offered as an extremely versatile sports model, benefiting not only from thinner construction but the added lightness of titanium as opposed to stainless steel. The Luminor 3 Days Titanio features a brushed titanium finish with a deep blue dial and matching alligator strap, while the Luminor Due 3 Days Oro Rosso, the most fashion-minded model, comes with a rose gold case, ivory dial with blue numerals, and light blue alligator strap. Both feature the in-house manual wind P.1000 movement with a three-day power reserve which has been skeletonized. The next two models increase in size to 45 mm, and come equipped with the in-house P.4000 automatic calibre movement. The Luminor Due 3 Days Automatic Titanio has a titanium case, rich blue dial and a matching alligator strap. The Luminor Due 3 Days Automatic Acciaio has a AISI 316L stainless steel case, deep anthracite dial and a dark brown alligator strap. Of the lost the ivory-dialed Luminor Due 3 Days Oro Rosso is our least favorite. Ivory dialed Panerais have never held the same appeal for us, and though the blue numerals are a nice touch it does not particularly suit the rose gold case, while the shade of the alligator strap is a bit too light for our taste. Especially given its thinner case this piece might appeal to women. 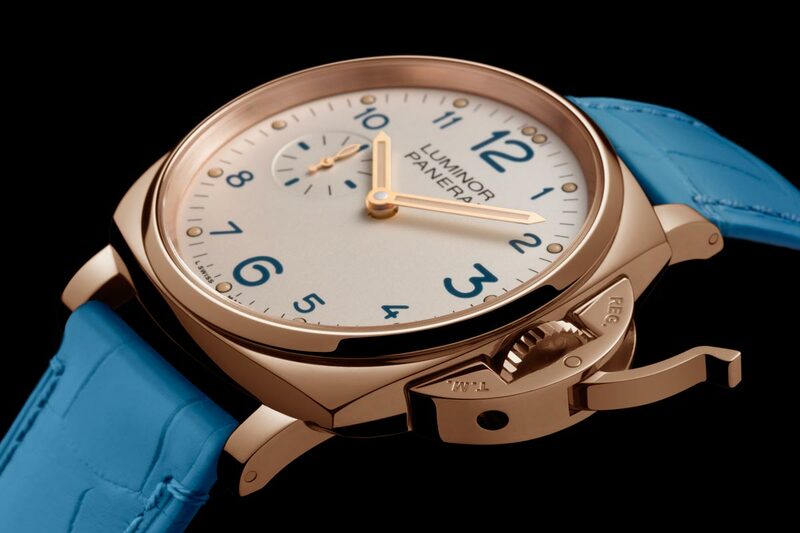 What are your thoughts on the new collection of the Panerai Due models?